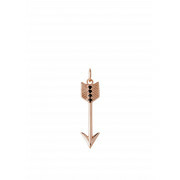 A stunning arrow necklace charm from the Kirstin Ash Jewellery range, this necklace charm is a beautiful piece for any occasion. The beautifully designed necklace charm features number of black gemstones and a rose gold plated finish. Wear this piece solo or team it up with another charm from the Kirstin Ash range and make a lasting impression.